Our newsletters have a sprinkling of shop news, design tips, marketing inspiration, and featured projects. Monthly highlights are included here, to get full issues subscribe or use the archive links on this page. Every week pallets come into Juneau loaded with goods we all need. But what happens to the pallets after that? We’re looking for a better solution. Did you know that every year 500 million pallets are made in the US and 2 billion are in use? Even with a growing pallet recycling industry in the Lower 48, millions of pallets still end up in landfills. In Juneau, we don’t have an efficient solution for recovery, repair, recycling, or reuse of pallets. If you have ideas for a long-term solution to reuse or recycle the pallets that come in every week for Juneau businesses, we want to hear them. Send us a message! Create a custom banner to display your message. X-Tend 3 features a lightweight, X-shaped frame and vinyl graphic finished with #2 grommets in each corner. 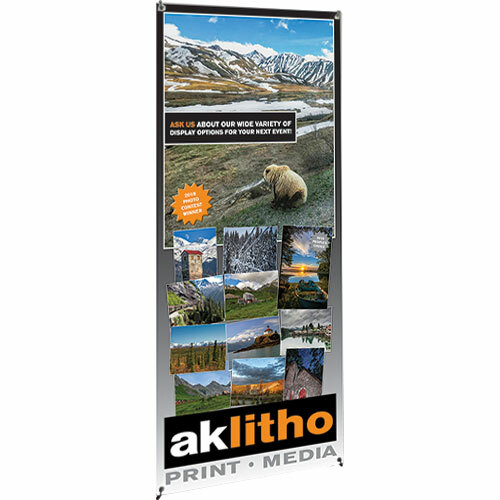 31.5 x 70.88″ banner with your graphics easily attaches to the frame for a quick display. Carry bag included. Call us at 907-586-3170 or order online. HOLIDAY HOURS: Alaska Litho will be closed December 24-25 for Christmas. For the New Year we will be open 8am-12pm on Monday, December 31, and closed Tuesday, January 1. Our sister shop Copy Works will be closed December 22-25 for Christmas. For the New Year, Copy Works will be closed Saturday, December 29, open 8am-12pm on Monday, December 31, and closed Tuesday, January 1. Happy Holidays from everyone at Alaska Litho. We hope your season is filled with joy and laughter. We hope you had a Happy Thanksgiving and are enjoying all the fun events happening in our community. There are so many things to do this time of year. If you need help getting your holiday cards, envelopes, 2019 photo calendars, canvas prints, or other custom gifts ready give us a call! We love to help make the magic happen. And if you haven’t visited the Juneau Holiday Village yet, check it out and look for the neighborhood we sponsored! Copy Works will be closed Thursday, Friday, and Saturday for the holiday weekend. We hope you have a happy and festive holiday weekend! Our newsletters have a sprinkling of shop news, design tips, marketing inspiration, and featured projects. We also send out short alerts if something is happening we think you'd like to know about. As an example, you'll hear about our annual photo contest and get a notice when there's a sale or new business workshop.